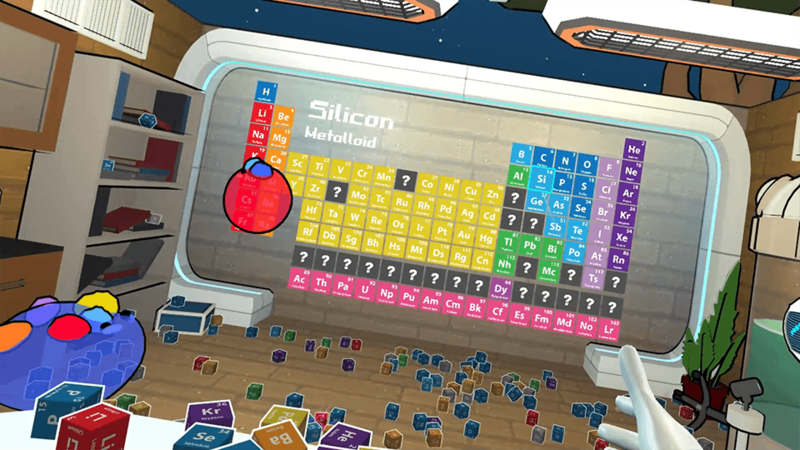 Description: Tablecraft is a blob-friendly virtual reality game that lets you use the chemical elements to craft stuff. Use the things that you craft to feed your blobs so that they can poop new elements that’ll let you craft new stuff. Depending on the things you feed them with, you’ll get different baby blobs! Skills and Ideas Taught: At a baseline, Tablecraft greatly increases player familiarity with the elements, acronyms, atomic masses, and groups on the Periodic Table of Elements. In addition, it helps players to conceptualize the objects in their day-to-day life as being made of elements, and of certain elements having properties that are relevant to how that object looks, feels, or behaves. The game also teaches players about the subatomic particles which make up an atom, and how different numbers of particles in an atom changes an elements’ properties. Goal or Challenge: The primary end-goal in Tablecraft is to discover all of the Elements and complete the entire periodic table. It is a sandbox game, so it is not always strictly challenging, so much as discovery-oriented. That said, players who use or develop their knowledge of which elements an object is made of, or what group an element belongs to, will be able to engineer blobs more precisely, and reach the end of the game more quickly! Assessment Approach: Players who are knowledgeable and attentive enough at each stage of the game will be able to progress in the discovery of new elements. Particularly skilled players will be able to progress more quickly, and be more creative in their interactions with the blobs and other playful components of the game.